It’s May in full-tilt, and (unbelievably already) time to post this month’s canjam double-header creation. Really, my single-batch-mindedness was the result of finances. 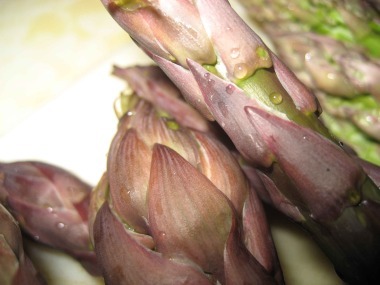 I could only afford to buy two bundles of asparagus at my co-op. I’ve lived for three months on less income than I thought ever possible (book contracts take a long time), so thriftiness is at the forefront of my priorities. What’s truly ripe is the opportunity to dig in to Eugenia Bone’s Kitchen Ecosystem idea and a little ol’ fashioned depression-era thinking. I can’t wait for our (very first!) CSA farm share to start up at the end of the month; I have yet to can anything in the midst of real over-abundance. Objectives: As many additions/utilities to my kitchen ecosystem as possible, minimal wastes, at least one jar of waterbath canned pickles for the Tigress Can Jam. 1. FRESH. Duh. Why do I always forget to do this? In the frenzy of small-batch putting up, I forget that the best way to eat anything is fresh. What a funny thing to forget to do: enjoy season’s bounty before putting it by. 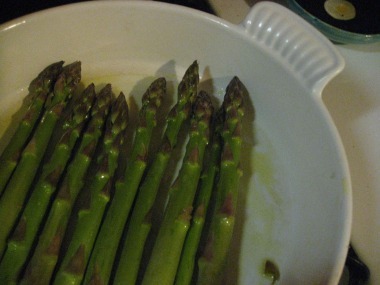 Appearing in my Julia Child, Le Creuset dish, found for $10 at the Bklyn Flea.Anyhow, a small handful tossed with a little olive oil, and garlic then roasted in the oven set the stage for a perfect evening of asparagus action. 2. PICKLED. I consulted Linda Ziedrich’s and Eugenia Bone’s books, The Joy of Pickling and Well-Preserved, respectively. This is a fresh pickle (i.e. not fermented) so I followed what appears to be the basic pickle protocol. 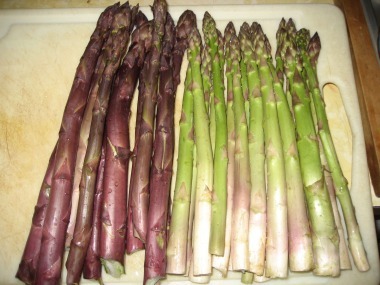 Blanch the asparagus: Combine liquids in a non-reactive pot with salt, sugar, garlic and spices. Bring to boil and then remove from heat. 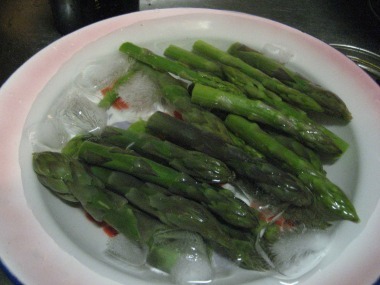 Drop the dried red pepper in your sterilized pint jar and pack asparagus into the jar tightly (so no stalks float to the top when the vinegar is poured in.) Eugenia says top up; Linda says either way. I opted for top down so they’re easier to pull out. 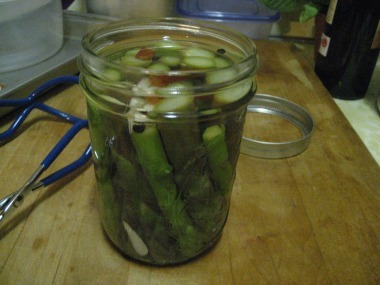 Pour vinegar mixture over crammed asparagus leaving 1/2 inch from the top rim of the jar. 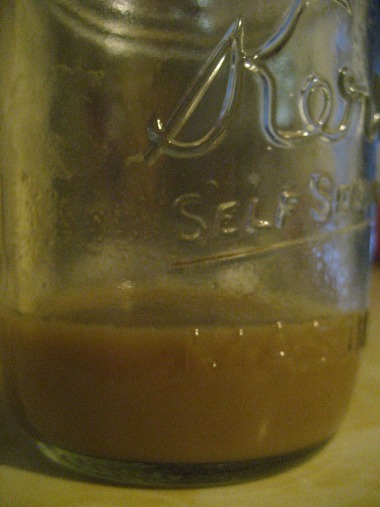 Throw the simmered, appropriately warmed and gummy-rimmed lid on and process for 10 minutes in waterbath canner. I’ll tell you how delicious they are in three weeks. Oh, wait. The night’s not over in asparagus economy-land. 3. SOUP, cream of. Well, here’s the deal. I used the mid-sections (the areas just below the tip sections that I pickled) and sauteed them with an onion, garlic and pat of butter until soft. 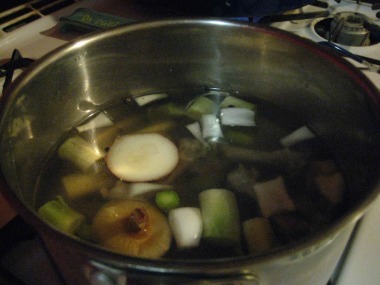 Then I added enough stock (home-frozen and thawed, something I already had in my kitchen ecosystem!) 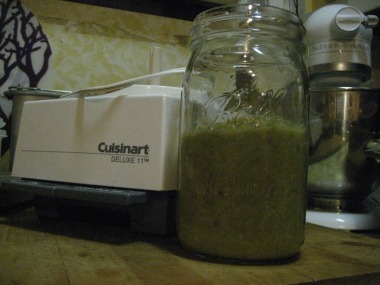 to make the sauteed veg creamy in the mighty food processor. Ideally you’d make the soup the night or day of your pickling and avoid all these crazy steps. I was waiting for my J to come home from DC, though. 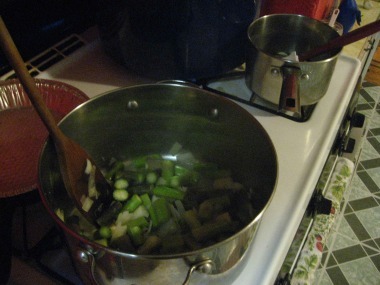 So I made an asparagus soup concentrate where I’d just have to add stock, milk and salt to taste. Recipe inspired by The Joy of Cooking, with liberties taken to spread the process out until I was ready to make it two days later. Results: lunch for two and dinner for one. Slurp. 5. HYDRATE. Canner pot water to garden (after it’s cooled for a day.) The lobster pot canner volume filled my two watering cans perfectly. My strawberries appreciated the drink. I did it. I cheated. Three weeks in the larder is for people with willpower, of which category I am not. Nearly two weeks was fine for me. The cardamom-spiced, pickled asparagus was really interesting. I liked the fragrant, yet still sour (not sweet) twist on a pickle; J wasn’t crazy about it (word up from the Italian of our house.) Official verdict: probably wouldn’t use cardamom again unless I was making some sort of Indian-inspired, pickled slaw. The texture of the asparagus was PERFECT. I deem my second pickling attempt (ever) a success on all accounts.